Hey lovelies, I have a skincare review for you today. If you've been following my blog this year, you will notice that I jump at the chance to review anti-aging eye products. 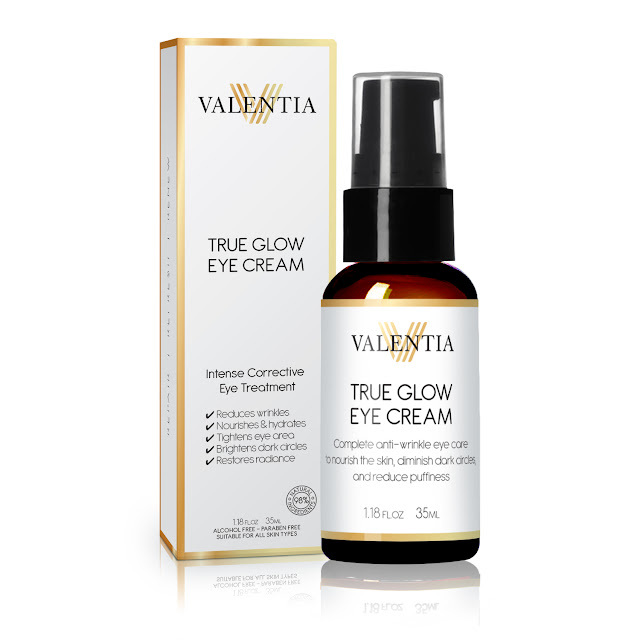 Valentia True Glow Eye Cream is the last eye cream review of 2015! Age 38 is the year my eyes began to change. Crow’s feet have invaded and I've been trying out a myriad of eye products to erase and keep them at bay. I also suffer from occasional eye lid dryness and dark under eye circles. This month has been a busy one for me. As a result, "I can't get no sleep." Which means those pesky dark circles and bags want to show up. I was excited to try this eye cream because it contains rosehip seed oil (I adore this oil). Any product with this oil in it I want to try. I also have had positive experiences with Valentia in the past. Therefore, my expectations were high for True Glow Eye Cream. I've used this for two weeks and I feel it is good. I like it but it is not the best I've tried this year. It does keep dark circles and puffiness away. I love the way it moisturizes -- that rosehip seed oil at work. I haven't seen any improvement in my crow's feet like I did using Solvaderm's Eyevage. I think Valentia's True Glow Eye Cream is ideal for someone in their 20s and early 30s who wants to take preventive measures. It will help keep dark under eye circles and bags at bay. However, I don't see it being very helpful with crow's feet and fine lines. This is coming from someone whose crow's feet are not visible unless you get right up in her face and look. If your eyes have fine lines or wrinkles this cream might not do much for them. It is good for moisturizing and taking care of under eye issues like dark circles and puffiness/bags. Since I brought up what age range I feel this product would be ideal for, I'd like to know when did you lovelies begin using anti-aging products?